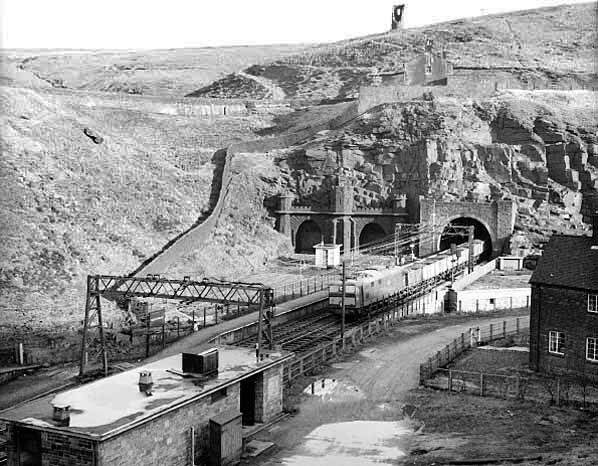 Notes: Woodhead Station was adjacent to the western portal of Woodhead Tunnel. 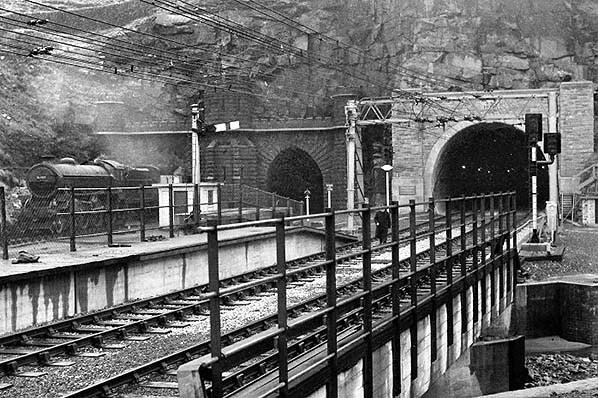 The tunnel was initially a single bore with a second bore being opened in 1852. 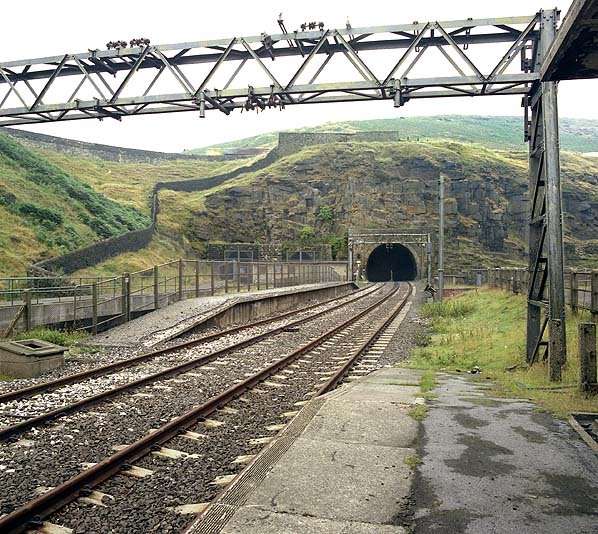 When electrification of the line was planned the twin-bore Woodhead tunnels were to narrow and low to allow for the overhead electric cables. Rather than enlarge these tunnels, it was decided to create a new tunnel, immediately to the south of the old ones; this was opened in 1953.
blocked by road construction preventing any future reopening. 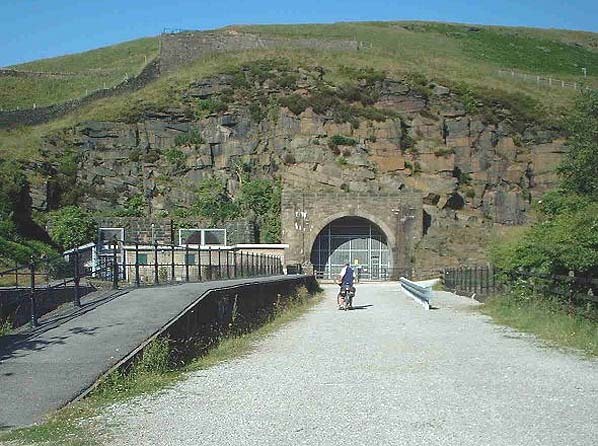 The 12 mile Longendale Cycle Trail now runs from Hadfield to the west portal of the Woodhead tunnel passing through the station site. 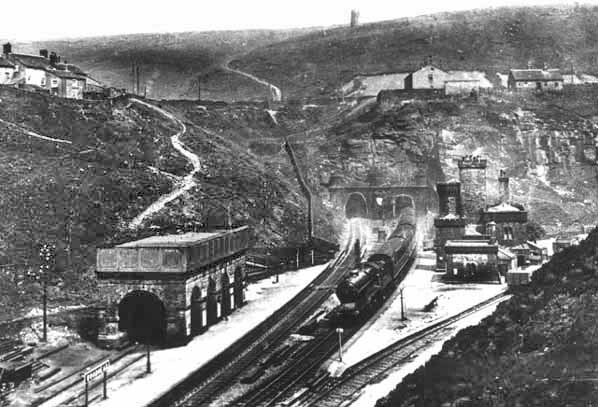 The original Woodhead station and tunnels c. 1902. An unidentified Thompson B1 is seen at Woodhead in June 1954. These locos were common on the Woodhead route and the ex-GCR in general with most seen on the Woodhead route being based at Darnall, Gorton and Mexborough. The picture is curious as on the new tunnel portal the plaque commemorating the new tunnel is in place and on the right is what appears to be the steps and little platform from which some dignitary made a speech. The rails of the nearest track emerging from the new tunnel appear to be rusty and thus not yet in use while the B1 is running wrong line. 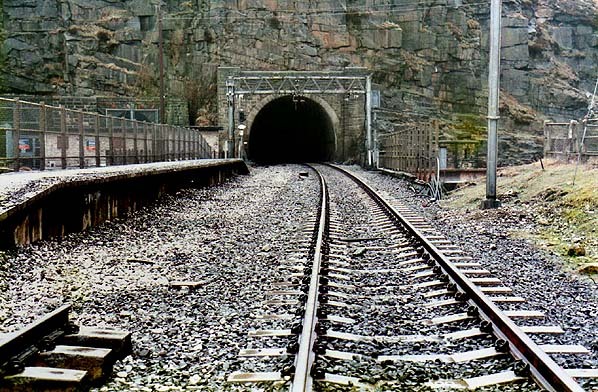 The track through the second bore of the old tunnel appears to have been lifted, thus the implication is the new tunnel in use only in one direction. Lights are on in the new tunnel, suggesting work is ongoing - signalling perhaps. 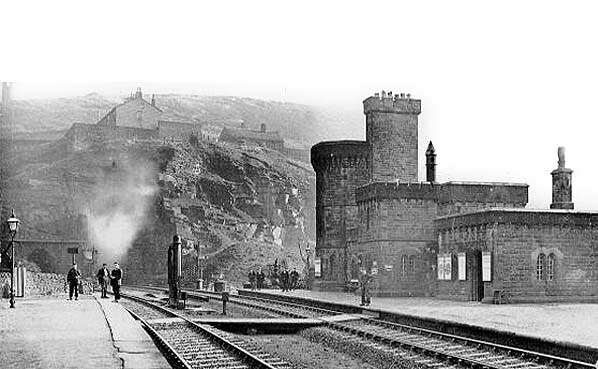 Woodhead Station and the old and new Woonhead tunnels in February 1964. The end of the platform of the original Woodhead Station can be seen on the far left. 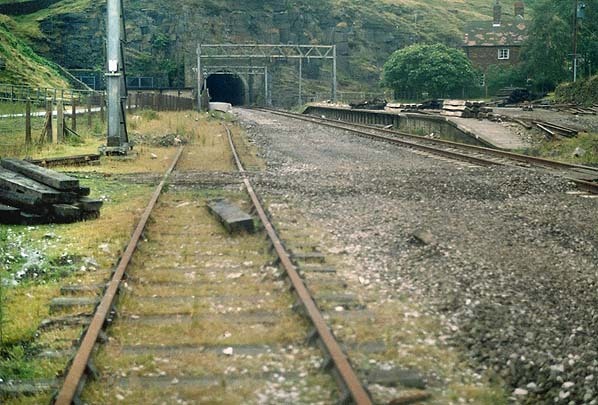 Woodhead station seen from the western portal of the tunnel in June 1982. 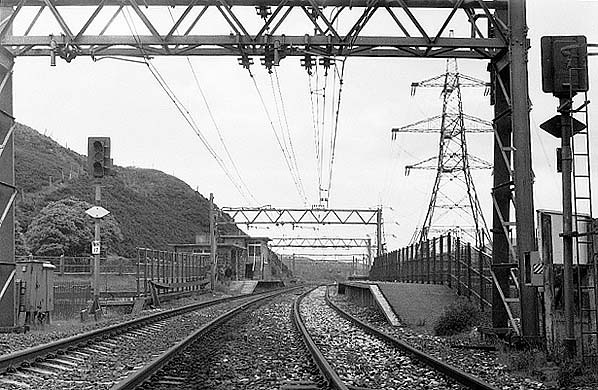 All the infrastructure of the railway was still in situ almost a year after closure of the line. 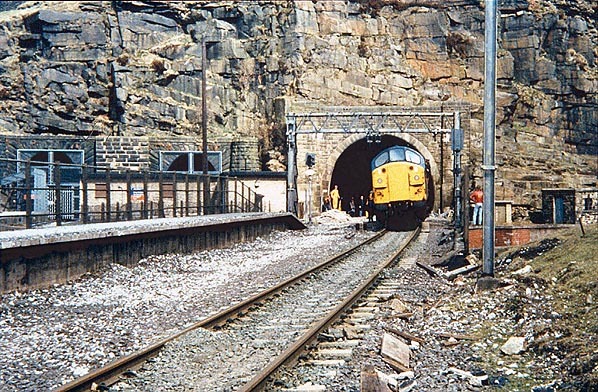 Class 37 37024 emerges from Woodhead tunnel for the last time on Sunday 4 May 1986 after track recovery had reached the tunnel entrance. 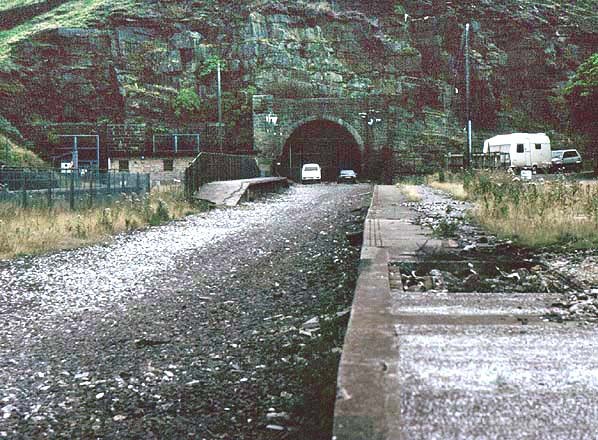 Woodhead tunnel and station in 1985 during track lifting. 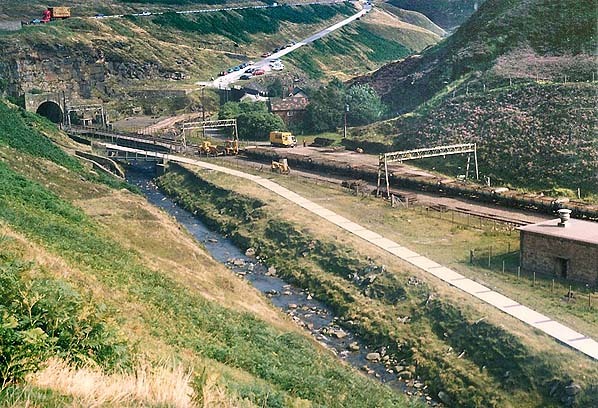 Looking east towards Woodhead tunnel and station in 1985 during track lifting.